DML continues its small scale light 4 x 4 German armored car series with the dedicated radio command version. 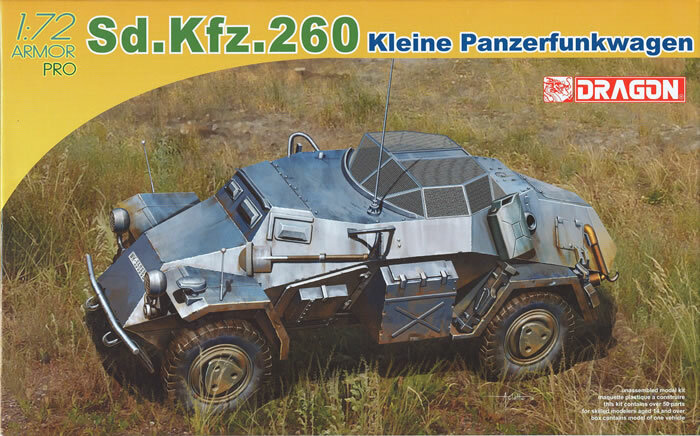 But whereas the earlier Sd.Kfz. 222 and Sd.Kfz. 223 kits gave a “1+1" kit with two in the box, this kit provides only a single vehicle. The kit comes on three sprues of parts with separate one-piece upper and lower hull sections. All parts attach to the hull. However, whereas the first two had turrets this one simply has a solid plastic grenade screen with two flip-out hatches for access to the sides. It also provides the “rod” type antenna vice the “bedframe” antenna of the previous models. New parts are provided to the basic 222/223 parts to make the 260, but whereas the directions note the new fenders for the left side they ignore the right side ones completely! Two finishing options are offered: Unidentified Unit, 1941(grey, unreadable registration plates); Unidentified Unit, 1942 (sand with brown and green overspray, unreadable registration plates). Number plates are provided along with a number jungle, all from Cartograf, but no specific vehicle numbers are called out. Overall this is a nice little kit but one in the box makes it more expensive than its two predecessors.